Last night was the final choir concert of the year at Bountiful High. It always makes me a little sad to watch that concert. Next year, we will have watched a total of 9 years of choir concerts at BHS. Larry Smith, the director, does an amazing job with kids in the choirs. I mean, it’s nothing short of a miracle to get groups of 100+kids to sing, and sing well. Last year, when Stephen was a Sophomore, they had over 100 boys in the 10th GRADE BOY’S CHOIR. Hmmm. Unusual. And they sounded awesome. Same for the Jr. and Sr. choirs. That doesn’t even take into account any of the select choirs. My friend Melinda, who is an amazingly talented actor (or is it actress? I heard it was politically incorrect to call women “actresses” anymore), singer and choreographer, gives up her time to choreograph the songs. There are costumes, and props, and lots of dancing. Amazing. She gets the non-dancers to dance. I wonder how she does it. How Larry does it? How do you take a group of teenagers and turn them into performers? Scholars? Debaters? Leaders? Athletes? I also watched the Dance Company recital last week. Another amazing performance night. Jan Whittaker is their coach. Those girls (and one talented and uninhibited young man) took state this year. Hours and hours of practicing, rehearsing, learning dances. Dances most teams would never take on at the high school level. How does Jan get those girls to dance their way to a state title? I think you believe in them. It’s that simple. While observing relationships my kids have had over the years with teachers, church leaders, coaches etc. – I notice most often, they perform, or play, or produce the most when they are associated with leaders who love them (in spite of their imperfections), are willing to teach, work hard and maybe most important- believe they can achieve, even excel. My oldest daughter studied piano for 8 years with Dr. Bonnie Gritton at the University of Utah. Corrine began learning her first movement of a concerto at age 11 or 12. She played her first concerto at age 14. Bonnie believed in her students, and they played – UP – to Bonnie’s expectations. Bonnie turned a little girl who simply loved playing piano into an accomplished pianist earning multiple piano performance scholarships. Believing in another person can change a life. I’ve seen it happen. So, as school winds down, and you are trying to think of ways to thank someone who has changed you or your kids for the better, mix up a batch of these yummy butterscotch cookies and write a note of appreciation. And remember to believe. Cream butter and sugars together. Add eggs and vanilla. Add all dry ingredients except oatmeal. Mix in oatmeal. Do not over mix. Just until wet and dry ingredients are incorporated. Mix in chips and nuts. Scoop out golf ball sized amount of dough. Place on ungreased cookie sheets. No more than 6 cookies per sheet. Bake in 350 degree oven. When cookies are almost done, at the 8 minute mark, open oven and flatten a bit with a spatula. Continue baking for about 2 minutes. Remove from oven and let cool completely. Melt about 1 cup of white chocolate or vanilla chips in a small Ziploc bag in the microwave. This takes about 30 seconds to 1 minute. Squish the chips around in the bag a bit until all chips are melted and smooth. Snip off the end of one corner of the bag. 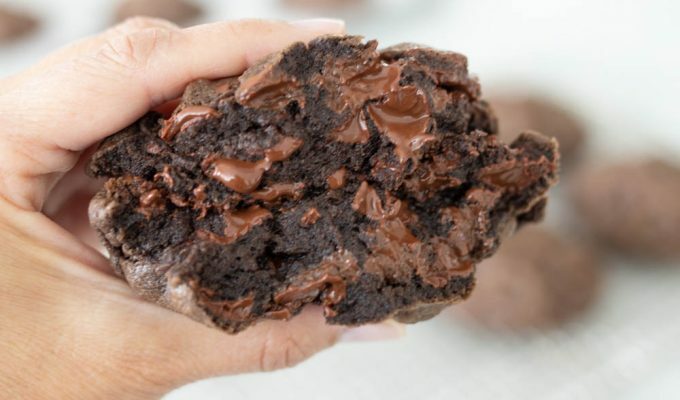 Drizzle the chocolate over the cookie. Let cool again until drizzle is set. Makes about 2 1/2 dozen 4 inch cookies. -You don’t have to add the drizzle, I wanted to dress the cookies up a bit. But I have to say, I really liked the butterscotch-white choc combo. -Don’t use a mixer once you add the oatmeal. Just mix in with a wooden spoon or spatula. Si, I want to be you when I grow up. Thanks SI for the shout out….and the cookies were divine! Awesome post Si. In order to be one of the teachers you talk about, you have to sometimes take a little Simba out of your shirt and hold it up while your kids are singing Circle of Life. All of your food tastes and looks fantastic. I love your thoughts. What a lovely post! I am sure the fantastic drama and choir teachers at BHS appreciate the recognition – I know I have always heard great things about the programs there. The cookies look fantastic – who wouldn’t love a plate of those! Si, I love reading your comments. You are so kind to note people and your words are so uplifting.I always feel happier after reading your site. We could all do a blog called “the wonderful qualities of Si”. I’ll get on that right away. In addition, your recipes are THE BEST! I attest that the cookies are divine. I also LOVE your children and I believe in them, so maybe that is why they like me, or at least I THINK they like me! Those look so pretty! Oatmeal Scotchies were my favorite cookies when I was a kid.